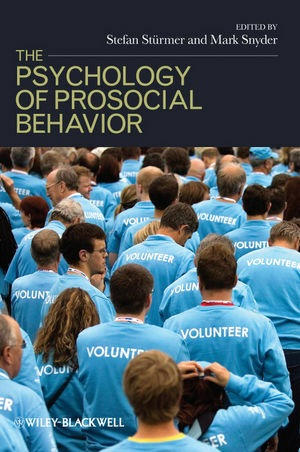 The Psychology of Prosocial Behavior provides original contributions that examine current perspectives and promising directions for future research on helping behaviors and related core issues. Stefan Stürmer, Ph.D., is Professor of Psychology at the Fern Universität in Hagen (Germany), and the Chair in Social Psychology. In his research, he investigates inter- and intragroup processes, with a particular emphasis on the role of group processes in social movement participation, cooperation, helping, and altruism. He also serves as a consultant for various city councils and community agencies, concerning measures and policies to foster community action and civic participation. Mark Snyder, Ph.D., is Professor of Psychology at the University of Minnesota, where he holds the McKnight Presidential Chair in Psychology and is the Director of the Center for the Study of the Individual and Society. His research examines the motivational foundations of individual and collective action. He is recipient of the Society for Personality and Social Psychology’s Donald T. Campbell Award and the Kurt Lewin Award of the Society for the Psychological Study of Social Issues. He is the author of the book, Public Appearances/Private Realities: The Psychology of Self-Monitoring, and co-editor of Cooperation: The Political Psychology of Effective Human Interaction. Introduction: The Psychological Study of Group Processes and Intergroup Relations in Prosocial Behavior: Past, Present, Future (Stefan Stürmer and Mark Snyder). Part I: Motivations for Helping In-group and Out-group Members. 1 The Tribal Instinct Hypothesis: Evolution and the Social Psychology of Intergroup Relations (Mark Van Vugt and Justin H. Park). 2 Helping “Us” versus “Them”: Towards a Group-Level Theory of Helping and Altruism Within and Across Group Boundaries (Stefan Stürmer and Mark Snyder). 3 Stigmas and Pro-Social Behavior: Are People Reluctant to Help Stigmatized Persons? (John B. Pryor, Glenn D. Reeder, Andrew E. Monroe, and Arati Patel). 4 The strategic side of out-group helping (Esther van Leeuwen and Susanne Täuber). Part II: Consequences of Giving or Receiving Help in the Context of Groups. 5 Discrimination Against Out-group Members in Helping Situations (Donald A. Saucier, Jessica L. McManus, and Sara J. Smith). 6 Receiving Help: Consequences for the Recipient (Samer Halabi and Arie Nadler). 7 Turning to Others in Times of Change: Social Identity and Coping with Stress (Jolanda Jetten, S. Alexander Haslam, Aarti Iyer, and Catherine Haslam). 8 Volunteering Across the Life Span: Doing Well by Doing Good (Jane Allyn Piliavin). Part III: Intervention Strategies: Targeting Individuals, Groups and Organizations. 9 Perspective Taking and Intergroup Helping (Mark H. Davis and Angela T. Maitner). 10 Recategorization and Prosocial Behavior: Common Ingroup Identity and a Dual Identity (John F. Dovidio, Samuel L. Gaertner, Nurit Shnabel, Tamar Saguy, and James Johnson). 11 Groups, Identities and Bystander Behavior: How Group Processes Can Be Used to Promote Helping (Mark Levine and Clare Cassidy). 12 Influences of Psychological Sense of Community on Voluntary Helping and Prosocial Action (Allen M. Omoto and Mark Snyder). 13 Empowering the Volunteer Organization: What Volunteer Organizations can do to Recruit, Content, and Retain Volunteers (Naomi Ellemers and Edwin J. Boezeman). Part IV: The Broader Picture: Political and Societal Implications. 14 Interpersonal and Intergroup Helping Relations as Power Relations: Implications for Real-world Helping (Arie Nadler). 15 Beyond Help: A Social Psychology of Collective Solidarity and Social Cohesion (Stephen Reicher and S. Alexander Haslam). 16 Cross-group Helping: Perspectives on Why and Why Not (Stephen C. Wright and Norann T. Richard). 17 Helping Disadvantaged Out-Groups Challenge Unjust Inequality: The Role of Group-Based Emotions (Aarti Iyer and Colin Wayne Leach).